The American pitching staff gave up an early two runs in the first inning, but it was smooth sailing the rest of the way, en route to the 8-2 victory. American pitchers allowed just six hits on the night, with the National Team tallying just three hits over the last six innings. They issued just two walks and struck out 14 hitters with Jack Leiter striking out three hitters in the fourth inning. Let’s take a look at the American pitching staff, in the order in which they appeared in the game. Scouting report information comes from Baseball Factory scout, Andy Ferguson and Baseball Factory’s Executive Vice President, Steve Bernhardt. Malone worked from a compact, coordinated delivery that leveraged full rotation of his chest and core through release. His arm worked from the glove with medium depth, and was driven out front through release with power to finish. He’s a good athlete with a projectable 6-foot-4 205 pound frame, and featured a three pitch mix in his bullpen session. Live in game action, he threw his fastball up to 97 from the windup, with a lot of 94’s and even a 96 from the stretch. Through an inning of work, he featured almost exclusively heaters with a couple of low to mid 80’s breaking balls mixed in. His secondary stuff is not to the level of his fastball yet, but that is not uncommon with power-armed young pitchers. With his combination of athletic ability, clean delivery and easy powerful arm action, there is every reason to expect to him to find the feel for second and third offerings to compliment his electric fastball. Barco pitched from a three quarters to low three quarters arm angle with a short stride and a generally upright posture. From this position he is able to get on top of his changeup for diving sink in the low 80’s, and he can generate arm side life on his low 90’s fastball. It looked like he also threw a fork ball or splitter in his bullpen session, and that may have been what came out to retire Maurice Hampton, Jr. on a swinging strikeout. He fanned one more swinging, and gave up an infield single along with a groundout to retire the side in the National 2nd inning. We noted an 82 mph slider to round out his three pitch mix. We don’t commonly see standout breaking balls from this slot, but he spins it well enough to keep left-handed hitters honest and has the change/split to work the ball down and/or away from right-handers. After pitching in the bottom of the second inning, Barco played first base for the last five innings of the game. He showed strong hands and big left-handed raw power in batting practice. It’s a pull-oriented approach, but there’s something to work with that may be enough at the college level. We’d rather see him focus his time and energy on the mound, where he’s only a breaking ball away from a filthy three-pitch mix from a very tough slot. Following his Wednesday evening bullpen session, we absolutely loved the way Cornelio’s arm worked and the way he finished out front. After gathering himself and breaking his hands in rhythm to allow his arm time to work on the backside, he rotated his chest and core beautifully to allow for excellent extension out front. He showed a changeup and slider along with a two-seamer with arm side life in that session. We saw the fastball at 92-93 in the game two days later, while the breaking ball and changeup were in the upper 70’s. He faced the top of the National order in their second time around, just two innings after they put up two runs in the first inning on two extra base hits. He retired them in order this time around, with two groundouts and a strikeout on a 92 mph fastball away. He is looking to find his way into the first round just like former Colorado Under Armour All-America right-handers Kevin Gausman (2009 UA Game, 2012 1st round pick) and Cole Winn (2017 UA Game, 2018 1st round pick). Interestingly, all three right-handers (Gausman, Winn and Cornelio) worked in the 90-93 range with their fastballs during their outings at their respective UA Games. Working from a balanced, coordinated delivery, Leiter featured a loose and full arm stroke with great finish out front. His fastball had noticeable sizzle and jumped on hitters, while his breaking ball had sharp downward break. It takes a great deal of arm speed and looseness to ride the fastball and to bury a breaking ball with that much downward action, especially when the fastball reaches up to 94 and the breaking ball reaches into the upper 70’s with that shape. Leiter walked the first hitter he faced, but then struck out three of the next four National hitters with an infield single mixed in. Major League bloodlines run strong in the Leiter family. Jack’s father Al pitched won 162 games over a 19 year Major League career, while Jack’s Uncle Mark won 65 games over an 11 year stint in the big leagues. Mark Leiter, Jr. made his Major League debut on April 28, 2017 with the Philadelphia Phillies. During his bullpen session on Wednesday evening, when he was coordinated with his delivery and used his athleticism to support his finish out front, Thompson was super impressive. As he develops, it’s likely we will see him sit stronger over his back leg so he can get more extension on the back side. His arm is so quick that he can make it work at present, but his best stuff is yet to come. He’s a long and wiry 6-foot-2 and 175 pounds, with leverage at his disposal to drive the ball down the slope of the mound. We saw exactly that on Friday night at Wrigley, where he used his leverage to create angle on his fastball that reached 94, while his combination of looseness and arm speed allows him to spin a tight upper 70’s breaking ball. He retired each of the three hitters he faced, including two ground outs to the right side of the infield along with a strikeout on a 93 mph fastball. In the bottom of the sixth inning, the National team was down 4-2 with the middle of the order due up. American right-hander Will Childers gave up a sharp single the other way to Riley Greene, but induced a ground ball double play from Rece Hinds on an 81 mph breaking ball, and then struck out Cesar Valero swinging on a 91 mph fastball away to retire the side in order for the second consecutive inning. 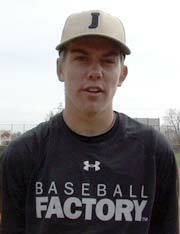 A good athlete with a large frame at 6-foot-4 frame, he’s also a high school quarterback with Major League bloodlines. His dad Matt Childers was a ninth round pick that saw big league service time with two organizations. We think he can get a good bit more from his delivery. It’s a simple and clean motion, but he works generally upright and does not fully take advantage of his length and leverage. With this evidence of upside to go with an already solid three-pitch mix, it’s easy to see him fitting a starter profile. The sole underclassmen on the American team, there was nothing about his stuff or the way he pitched that resembled his relative youth. Jared Jones filled up the zone with fastballs in the 94-96 mph range, with what seemed like little if any regard to nibbling corners. We saw an upper 70’s breaking ball and what looked like a slider at 85 mph, but for the most part, he simply dared hitters to try and catch up with his gas. There is room to nitpick if you so desire – his fastball lacks plane and there is some effort to his delivery – but the combination of a power arm and an aggressive, attacking approach doesn’t care about nitpicking. He retired the side in order, inducing a jammed popup to first base on a breaking ball, a fly out on a 93 mph fastball, and a swinging strikeout on 95 mph gas. Since there is no guarantee we will play the bottom of the ninth inning, each year we only schedule eight pitchers to throw for the visiting team in the Under Armour All-America game. Obviously, we still need to have the bottom of the ninth covered up in case the home team comes to the plate. So, the role of the last scheduled arm for the visiting team usually is assigned to a proven game performer and proficient strike thrower. Enter Avery Short, a perfect fit for the role. After getting into a bit of trouble in the eighth, he struck out Matt Carpentier and Rece Hinds swinging to preserve a 4-2 American lead. When he came back out for the bottom of the ninth, his team was now up 8-2. He wasted no time however in retiring the National side in order, with a pair of strikeouts and a jammed popup. Over the course of two innings, he worked from a simple and efficient delivery, threw a high volume of fastball strikes in the 86-90 mph range and showed feel for his breaking ball.